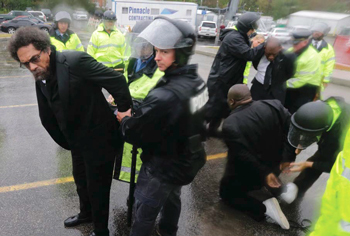 Philosopher Dr. Cornel West, left, and another man are taken into custody after performing an act of civil disobedience at the Ferguson, Mo., police station Oct. 13, as hundreds continue to protest the fatal shooting of 18-year-old Michael Brown by police in August. In fact, tensions escalated last week when a white police officer shot and killed 18-year-old Vonderrit Myers Jr., who authorities say shot at police before he was killed. That moment has captured some of America’s attention and exposed the country’s oppressive policing, racial failures and national shame to the world. “Missouri is the new Mississippi,” said Tef Poe, a young activist and hip hop artist from St. Louis. Youth protestors have taken to the streets to protest and demonstrate their anger and frustration with the shooting deaths of two young, Black men in Ferguson and St. Louis, Mo. The Ferguson teenager’s body lay in the street for over four and a half hours and a swift, militarized police response stoked outrage and a backlash from Black youth fed up with racial profiling, humiliation, targeting and abuses by police. 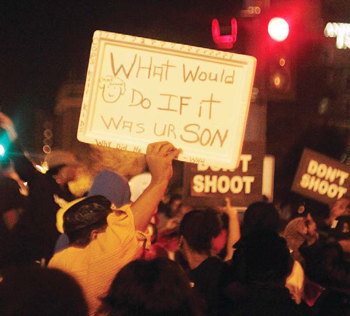 White officer Darren Wilson, who remains out of public view, shot the unarmed 18-year-old to death. Local police say the young man charged the officer after an encounter and struggle initiated because of jaywalking. Instead of ending up with a traffic citation, the teenager had at least six bullets pumped into his body. Witnesses screamed that the police were lying and an autopsy paid for by the family seemed to verify what witnesses said happened that Saturday afternoon. Mike Mike was shot with his hands up, said witnesses. 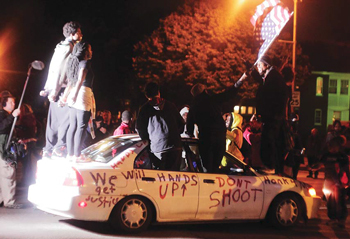 When social media beamed videotaped images around the country and the world—Black resistance had begun. Protestors question why no arrest has been made of the police officers who shot Mike Brown in Ferguson and Vonderrit Myers Jr. in St. Louis. “Black lives matter! 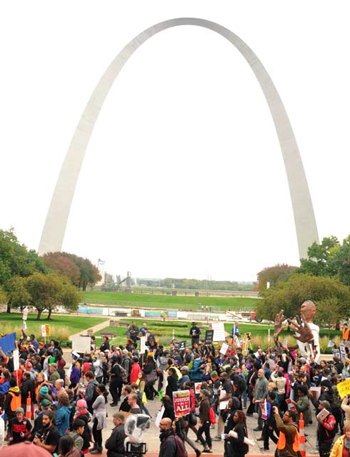 Black lives matter!” chanted demonstrators regularly throughout a weekend that drew Blacks, Whites, Latinos, Asians, labor, socialists, Muslim and Palestinian and other groups to St. Louis and Ferguson. The weekend was organized by the Organization for Black Struggle, a longtime activist group in St. Louis and new youth groups born out of two months of protests, arrests, pain and struggle. These groups include Hands Up United, Millennial Activists United and Lost Voices, which was composed of young people who literally slept on streets in early nightly standoffs against rubber bullets and tear gas in Ferguson, less than 15 miles from St. Louis. While “Turn Up Don’t Turn Down, We Do This For Mike Brown!” was an initial battle cry, by Monday, Oct. 13, “Justice for Vonderrit!” was added to the cry. The 18-year-old Black male was killed by an off-duty officer in St. Louis who was moonlighting as a security officer in the city’s Shaw neighborhood. Police chief Sam Dotson told the media the youth was killed after firing a weapon at the still unnamed officer. 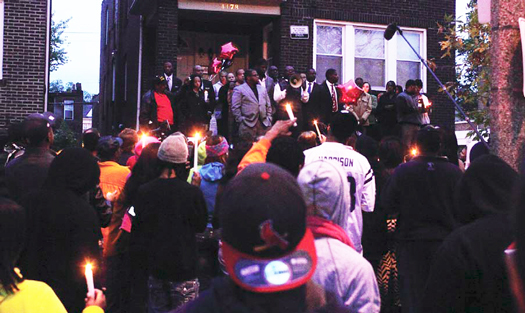 The shooting victim’s family denies the young man was armed. All he had was a sandwich after exiting a shop in the multi-racial neighborhood when the officer aggressively approached him and friends, they said. Protestors took to streets for Moral Monday and engaged in civil disobedience outside Wal-Mart and other targets in St. Louis and massed Oct. 13 outside the Ferguson Police Dept. Dr. Cornel West, who spoke at a program the previous night and participated in a 2 a.m. sit-in at St. Louis University, was among those arrested. “I didn’t come here to speak, I came to get arrested,” he had said at the Chaifetz Arena on the campus of St. Louis University. His word was made bond the next day as police took him away in handcuffs. 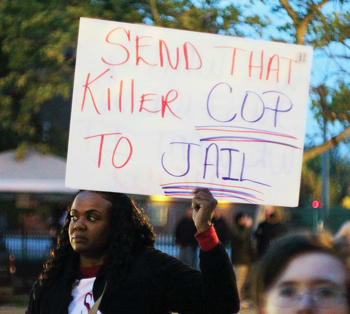 Black youth expressed their outrage over police killings during recent weekend of resistance. Sunday evening at the arena Dr. West was to be keynote speaker. But the interfaith program was interrupted by young people who demanded to be heard instead of simply listening while religious leaders and national figures like NAACP President Cornell William Brooks and the Rev. Jamal Bryant spoke. The crowd chanted its agreement and young people took to the stage. 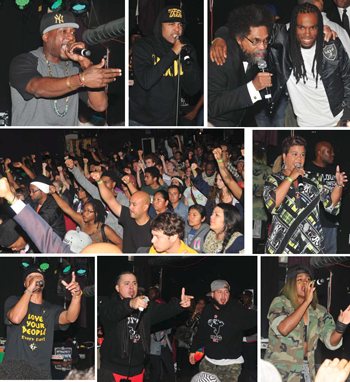 On stage, Tef Poe offered his street level assessment of issues and problems. 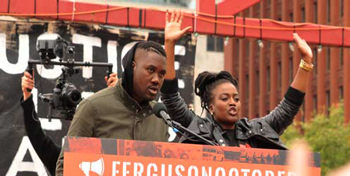 Activists Tef Poe and Ashley Yates emcee national rally against police violence. Thousands came to St. Louis and Ferguson, Mo. to participate in a demonstration against police violence, racism and oppression. “We are here to destroy systemic racism and White supremacy,” said one of the protest organizers as the crowd applauded and cheered. That isn’t anti-White, it is anti the 99 percent who exploit the masses of the people, he added. “I refuse to have my children grow up in this world,” he said. Calvin Green stood outside the Ferguson Police Station as hip hop music played and police lined up in riot gear. A thin yellow tape separated Mr. Green from the armed officers. He came in with a group of students from Kalamazoo, Mich., that included students from Western Michigan University and activists. “God allowed me to be here for a reason,” he said. “God allows us to be here for a reason. In our path we are supposed to serve our people, confronting his evil,” he said. The system tells Black children to be quiet but these are our children and they are crying out in pain, said Rev. Renita Lamkin. Instead of telling them to be quiet, we should be attending to their needs, she said. Parents are too busy, schools punish them and police and adults want them to go away, she said. But, added the Caucasian pastor, it’s time to stand with them. 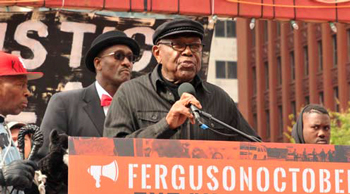 “The whole damn system is no damn good,” said Rev. Lamkin, echoing a chant youth have shouted day and night. And while youth are organizing and pursuing peaceful protest they are neither in a compliant mood nor in a mood to capitulate. Their peaceful protests are nose-to-nose with police officers and youthful rage over injustice is nearly boiling over. This entry was posted in Uncategorized and tagged Ferguson. Bookmark the permalink.